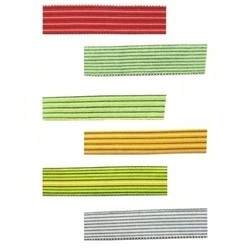 We bring forth for our clients a wide range of Crochet Tape. The offered tape is manufactured by our team using high grade material in accordance with set industry norms. It is widely demanded for use in different types of footwear. Known for supreme finish and high stretch ability, this tape is available in various thicknesses and finishes to fulfill the wide demands of the customers. We offer this at industry leading prices to the clients.